The United States of America is the world’s most popular and profitable region for all things esports. It’s also the second largest video games market in the world, with 160 million gamers set to spend over $25 billion by the end of 2017. With most of the biggest global esports tournaments such as The International hosted in the US and many of the best players and teams home-grown, American fans have it best when it comes to attending, following and betting on their favourite pro gaming events. If you live in the USA and want to bet on both local and international esports tournaments, this guide is for you. We cover a range of different esports betting sites legally catering to American punters and the US Dollar, along with the best and safest deposit options to use when placing bets on your favourite players and teams online. All of the sportsbooks we recommended and review offer betting markets for the world’s most popular esports tournaments, so if you love watching and betting on pro gaming events of Call of Duty, Dota 2, League of Legends, Overwatch, Rocket League and other titles, we’ll make sure you find the best value. Keep this page bookmarked as we keep you updated on the latest changes in USA esports betting. 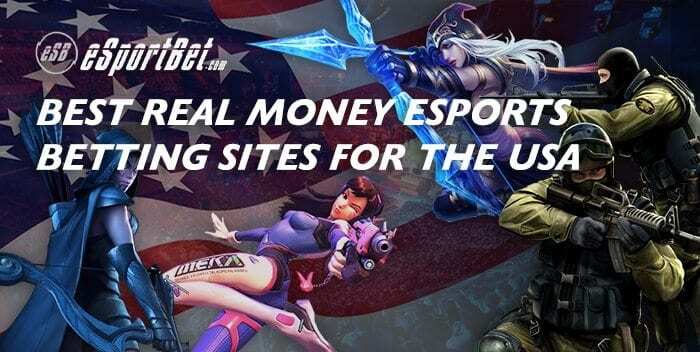 EsportBet.com recommends the following offshore real money sports betting sites for North American players due to their licensing, regulation and wide range of esports betting markets with best possible odds, including straight bets (winner), exotics, futures, line bets, first blood, map winner and more variants (dependent on the game). BetOnline: One of the best esports betting options for North American players, BetOnline is US-facing, takes all bets in US Dollars (or Bitcoin) and accepts customers from all 50 states. It has an easy-to-navigate betting interface with a dedicated esports section so users can easily find the latest leagues and tournaments they wish to place a bet on. BetOnline often post up early markets for every match with low mark-up on the odds, and offer additional value in their easy to claim bonuses and promotions, both ongoing and one-off. Bovada: A popular online sportsbook with casino, racing and sporting markets in addition to esports betting options. Great reputation due to its Bodog roots, with heaps of Bitcoin and USD bonuses you can put towards your esports wagering on CS:GO, Dota, Overwatch and more. Safe and recommended for North American customers. Sportsbetting.ag: Is from the same people that successfully run BetOnline which automatically gives them some credibility. The eSports section at this sportsbook is extensive with markets on the all the major events held in North America, and many of the bigger events right around the world. Counterstrike, Dota 2, League of Legends, Overwatch and Starcraft all feature prominently. One of the biggest drawcards is that they accept punters from every state in United States. The esports betting sites we recommend for US pro gaming fans are based and licensed overseas due to strict online gambling laws which vary state-by-state and restrict what local online esports sportsbooks can offer. They often carry superior welcome bonuses and promotions which grant additional value to signing up and regular play. For North Americans who prefer to bet with bitcoin cryptocurrency especially, there are some seriously great exclusive bonus deals presently offered to all of our readers who sign up through our provided links. USA esports fans can find out how to claim free bets and bonuses for esports betting in our provided guide. The online sportsbooks we recommend to North American esports bettors tend to have a smaller range of available payment methods than in other countries, due to the USA’s restrictive online gambling laws which prevent local residents from processing payments using traditional methods like direct bank transfers. However, US-based esports fans shouldn’t stress too much, as many sites still accept and support globally trusted and secure payment methods like bitcoin, credit card, debit card, and virtual wallets. Credit card: Using MasterCard, Maestro and Visa-branded credit cards is supported at some offshore sportsbooks accepting USA players. Usually it is the safest way to deposit money to bet on your chosen esports betting markets due to the worldwide reputation and proven security that comes with using credit. It’s also the fastest way to deposit betting money, with payments processed instantly. Withdrawals are equally as fast, usually within 72 hours. American Express is not accepted at any online sportsbook we recommend at this time. Cryptocurrency: Bitcoin and Litecoin are all the rage at the moment with many savvy Internet users and it’s becoming more and more mainstream to use them for online betting thanks to increased support from the world’s best betting sites. Esports sportsbooks are now offering huge bonuses to entice new sign-ups into using bitcoin and similar cryptocurrencies, and with zero deposit or withdrawal fees compared to other payment methods and it’s easy to see why it’s preferable for many – not even taking into account the anonymity and privacy. Gift card and prepaid card: MasterCard and Visa-branded gift cards and prepaid cards are usually supported at esports betting sites accepting American sign-ups, but they are only accepted if you make sure it is specifically allowed to be used for ‘International and online purchases’ prior to buying the card and loading it with funds. e-Wallets: Also called virtual wallets and web wallets, digital payment services like Neteller act as a middle-man between your personal banking accounts and esports betting accounts. You simply create a free acount with the service, link a funding method (bank account or card) and load up with how much you intend to bet with. Then you transfer the money in your e-wallet account into your account at your preferred online sportsbook. With the pro’s of anonymity and increased privacy comes a few con’s, such as added fees for withdrawals or transfers. For more in-depth information on how to deposit money at esports betting sites and which payment services best suit your country, make sure to check out our various guides linked to on this page. Is it legal to bet on esports in the United States? All that our North American esports readers need to know is this: You can 100% bet on esports online at certain sites, you just have to make sure to do extra homework on which payment services you can use to deposit and withdraw your betting money. For those seeking a more detailed, legal answer: To say online gambling and online sports betting laws in the USA is complicated would be a severe understatement. To properly breakdown and outline the legality of esports betting would require intimate knowledge of local, state and federal legislation and regulators which makes following which state has legalised which form of betting all the more difficult. We’re guessing most of our American visitors won’t exactly be able to recite every single gambling law pertaining to them off-by-heart, so below we do our best to summarise why esports betting is legal for Americans to partake in depending on the state you reside in, and so long as the betting site in question is based and licensed offshore. For starters, there are three key pieces of gambling legislation affecting esports betting: The Interstate Wire Act (IWA), The Professional and Amateur Sports Protection Act (PASP) and The Unlawful Internet Gambling Enforcement Act (UIGEA). All of these were enacted prior to the facilitation of esports betting, but they effect it nonetheless. The ‘Wire Act’ of 1961 was originally designed to stop sports betting wagers on telephone passed state-by-state, and the the PASP made it so no state can bypass current laws banning sports betting with new legislation. Both laws have been updated over the years to reflect the new technologies, such as the Internet, which has enabled us to bet from home, but both have never punished players making small-scale bets. It is the UIGEA that is the most significant, as it criminalised all gambling-related transactions processed at banks, which were once the main deposit option offered to USA sports bettors. Basically, the government wanted financial institutions to not process online gambling transactions. As a result, many online sportsbooks exited the U.S. to avoid the hassle and potential legal ramifications with dealing with such a complex market. However, what has ended up happening is many offshore online betting sites licensed in foreign jurisdictions have continued to service US-based players, and third-party payment services have filled the void and are now being supported at said US-facing online sportsbooks, still giving Americans legitimate ways to deposit money for the purposes of esports and sports betting. Because the act is intended to target large-scale illegal gambling rackets or criminal operations within the United States, it has been rare for individuals betting online from America at a sportsbook based overseas to be punished by the law. Also, because of many state-based laws and the fact that specific regulation for fantasy sports betting, skill games and esports is still catching up today, it’s a minefield to actually understand whether anything is explicitly banned or not, and for the time being, esports betting comes under that category. Until then, rest assured, it’s safe to bet on your favourite esports games – you just need to do your homework on which esports betting sites are the best for you. How popular is esports and video games in the USA? North America is without a doubt the world’s largest esports market. According to the latest consumer insights from NewZoo, there are over 23 million recorded esports enthusiasts living in the United States of America in 2017. The region produces the most revenue per esports enthusiast – $10.36 per fan per year, which is twice as much revenue annually than any other country in the world) and has the highest direct spend globally. Esports are nearly as popular as ice hockey, with 14% of North Americans aged 21-35 identifying as esports fans, and 18% of the group also enthusiasts of ice hockey. A report from games and interactive media intelligence group SuperData, ‘Esports Courtside: Playmakers of 2017‘ revealed Twitch remains the most popular live-streaming platform for watching major esports tournaments for enthusiasts living in North America, with 87% of US esports fans using the service. Youtube has picked up steam since, with 77% of US esports fans using the world’s most popular video-sharing site to watch esports curated content. In terms of US esports viewership split, 20% watch on Twitch only, 11% watch on YouTube only, and 67% watch esports on both. In the same research, the most anticipated esports video game among pro gaming enthusiasts living in the United States was found to be Overwatch. The latest reported revenues from esports in the United States are at $257 million generated in 2017, with estimates of growth over $600 million by 2020. The majority of said revenues are from sponsorships for US-based professional teams and the fact the world’s biggest comps, leagues and tournaments are based in the country – analysts predict this figure will total over $110 million for 2017. The 2017 Global Esports Market Report by NewZoo reports North American esports fans were responsible for 44% of the $32 million in total ticket revenue earned from major esports events held in 2016 (around USD $14,080,000) and 28% of competitive gaming events held around the world (out of 424) that year with prize-pools above $5,000, the majority in both categories. The biggest esports tournament in the world, such as The International and the League of Legends World Championships were held in North America, offering more than $25 million in prize money between them. With the many other pro gaming events held throughout the country, the US accounted for 56% of the total recorded $93.3 million in major event prize money handed out to esports winners globally in 2016 (around USD$52,248,000). The editorial team at eSportBet.com can only see the USA’s esports industry continue to skyrocket, especially with the re-structuring of The International and the many Dota 2 qualifiers along with the upcoming Overwatch League which looks set to be the next big thing. Visiting us from the USA? North American players are recommended to check out BetOnline, one of our top rated and reviewed esports betting sites for US bettors looking to place wager on their favourite CS:GO, Dota 2, League of Legends, and Overwatch players and teams all-year round.